A Brief History of the Visitors&apos; Center Building (The Old Nacogdoches Federal Building) The Nacogdoches Federal Building has served the city in many ways: as a post office, as office space for various government agencies, as an army induction center, a public library and currently as the city&apos;s Visitor&apos;s Information Center. Despite some renovations, the building stands today on the public square much as it has since its completion in 1918. The Federal Government obtained the title to the property on August 12, 1915, after a city election agreed to sell the property for $4,500. The contract for the building was not let until February of 1917. Construction delays - caused by deed problems, standardization of plans, bad weather and general bureaucratic red tape - were very frustrating for local citizens. By April of 1917, the basement was excavated and the foundations completed. The excavation of the basement took longer because the building was built on top of an old Spanish well. In order to circumvent this problem, eight feet of concrete was poured down the well shaft. The Daily Sentinel, due to the outbreak of World War I, remained silent on the Federal Building&apos;s construction until February of 1918, when it announced the post office&apos;s move. Since all of the equipment was new, only "the stamps, mail, and supplies" had to be moved. Local citizens were disappointed that the building was "...not so imposing in its appearance from the outside as was expected;" nevertheless, when the building was completed, the paper described the building as "... one of the most handsome edifices which adorns our pretty little city ...." The building&apos;s construction cost $50,000. In 1964, after Nacogdoches&apos; post office moved to a larger location on West Main, the Federal Building housed the Farmer&apos;s Home Administration, the Armed Forces Recruiters, the Federal Land Bank and the Federal Land Administration. In 1973, the government transferred the deed to the Federal Building to the City of Nacogdoches for "... educational use." The City of Nacogdoches renovated and used the structure as the public library until 1997. No changes, other than the addition of a sign, were made to the exterior of the building. From 1998 to 1999, the building was converted for use as the city&apos;s Visitor Information Center. While exterior renovations were limited to converting the loading dock in the rear into a stage and the addition of several ramps, interior renovations were extensive. The Nacogdoches Convention and Visitors Bureau opened the center in June 1999. Only the ground floor of the building was included in the 1998-99 renovation. In 2001, the second floor of the building was renovated to make additional office space. In 2005, the basement of the building was renovated to make additional space for historical displays, meeting and office space. • Monday - Friday, 9 a.m. to 5 p.m.
• Sunday, 1 to 4 p.m.
• Holiday Hours, 10 a.m. to 4 p.m. 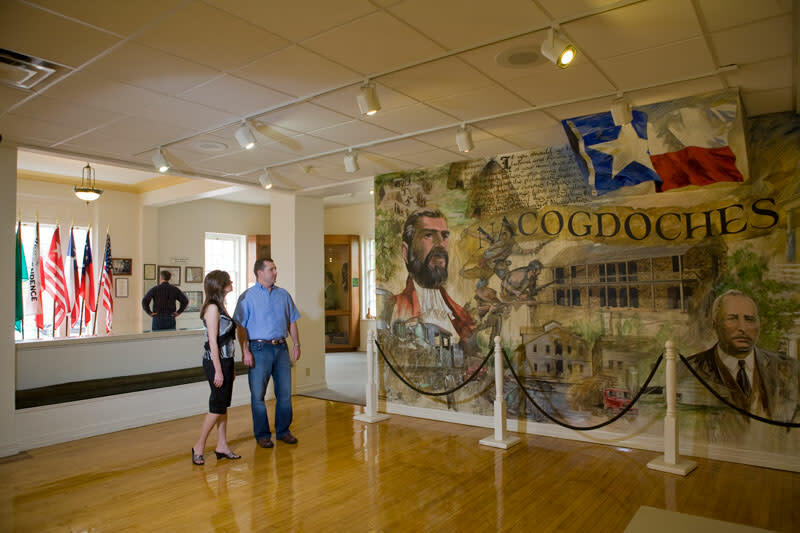 The Nacogdoches Visitors’ Center, operated by the Nacogdoches Convention & Visitors Bureau, is located in the heart of historic downtown, 200 E. Main Street (one block East of U.S. 59 Business). Here you will find some wonderful information on our town’s history and legends – from stories of early settlers to historical artifacts. •Monday – Friday, 9 a.m. to 5 p.m.
•Saturday, 10 a.m. to 4 p.m.
•Sunday, 1 to 4 p.m.
•Holiday Hours, 10 a.m. to 4 p.m.